A number of systemic, structural forces are intersecting in 2016. One is the rise of non-state, non-central-bank-issued crypto-currencies. We all know money is created and distributed by governments and central banks. The reason is simple: control the money and you control everything. The invention of the blockchain and crypto-currencies such as Bitcoin have opened the door to non-state, non-central-bank currencies--money that is global and independent of any state or central bank, or indeed, any bank, as crypto-currencies are structurally peer-to-peer, meaning they don't require a bank to function: people can exchange crypto-currencies to pay for goods and services without a bank acting as a clearinghouse for all these transactions. This doesn't just open the possibility of escaping the debt-serfdom of central and private banks--it opens the door to an entire global economy that's free of the inequality and concentration of wealth and power that is the only possible output of central bank created and distributed money. Recall that central bank money is borrowed into existence, which means interest must be paid until the money is extinguished by the payment of debt. In effect, today's wars, bread and circuses, etc. will be paid for in perpetuity by our kids, grandkids and their kids. This is debt-serfdom. The only possible output of borrowing money into existence is debt-serfdom. Debt jubilees, no matter how well-intended, simply maintain the system of bank-issued money and debt-serfdom: dialing back the debt load from impossible to bearable does nothing but continue financial feudalism. The Keynesian Cargo Cult's fetish is "demand"--meaning the "demand" created by having money in your pocket. The Keynesian Cargo Cult wrongly assumes that this "demand" will magically generate more goods and services. If this were true, then there would be no inflation when governments such as Zimbabwe print money with abandon: this new "demand" would magically generate more goods and services. But this Keynesian assumption is flat-out wrong. In reality, printing and distributing money does not guarantee a corresponding expansion of productive goods and services. The "magic" is misleading fantasy; the actual mechanism is much more complex than mere "demand." The second fatal flaw in the Keynesian Cargo Cult's "solution" of printing and distributing "free money" is the money ends up funding worthless or even destructive uses: bridges to nowhere, ghost cities, needless MRI tests, worthless college degrees, and so on, in essentially limitless mal-investment and waste. I propose instead that new crypto-currency money only be created when goods and services that are scarce in real-world communities are produced. I call this CLIME: the Community Labor Integrated Money Economy, and I describe how it works in my book A Radically Beneficial World: Automation, Technology and Creating Jobs for All. 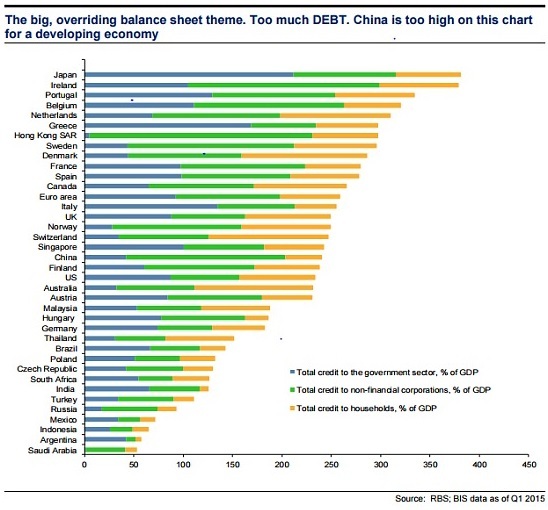 This is the unsustainable world of bank/state issued money: crushing debt loads across the globe. This is debt-serfdom on a planetary scale. Debt serfdom is no longer the only option - A Radically Beneficial World beckons.